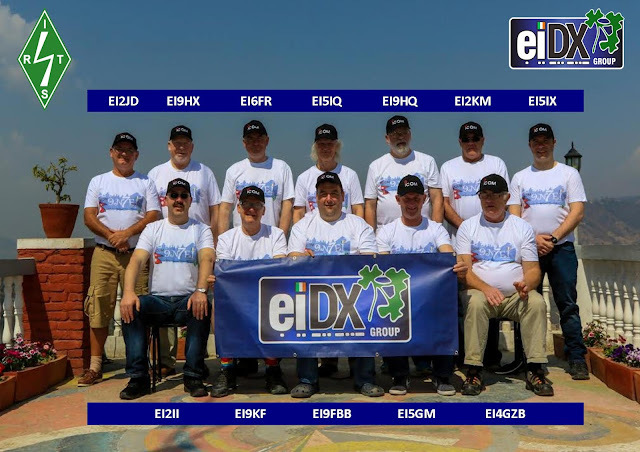 The EI DX Group was set up in January 2016 and consists of Irish amateurs whose intent is planning DXpeditions, and to promote the DXCC program and our hobby around the world. The group today has twenty-seven members and is loosely based throughout the island of Ireland. During 2016 various group meetings took place where many ideas were shared and various plans were discussed for the group’s first DXpedition. Many interesting faraway places were mentioned but when sky’s the limit the ‘Roof of the World’ had an interesting ring to it! 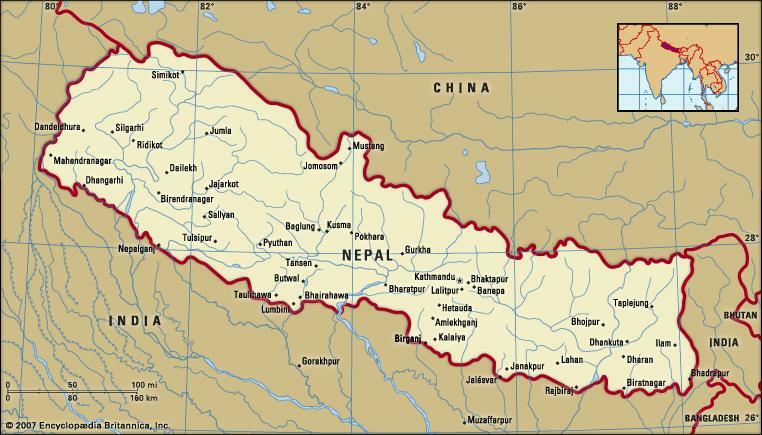 Nepal (9N), located in South Asia, shares territorial borders with India and China and with an area of 147,181 square kilometers and a population of approximately 30 million, sure who wouldn’t want to be stuck in the middle of it calling CQ? 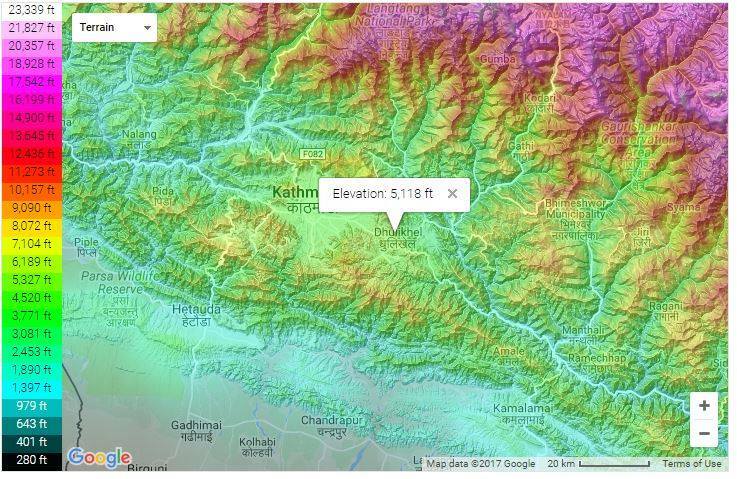 Kathmandu is the nation's capital and the country's largest metropolitan city. 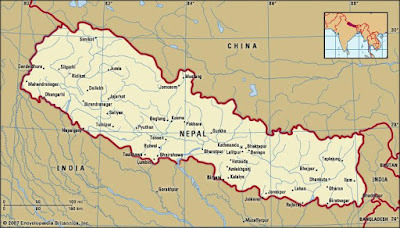 Nepal was previously ruled as a kingdom, today it is a federal democratic republic, highly diverse and rich in geography, culture and religions. Nepal is well known for its exquisite natural beauty, with the iconic Himalayas running across the northern and western part of the country, sure it’s the land of Mount Everest (8,848 meters) the world’s highest peak including another 240 mountain peaks over 6,000 metres high. Yes, we can safely say that Nepal ticked all the boxes! 5. It was on the top-100 most-wanted DXCC entities list. 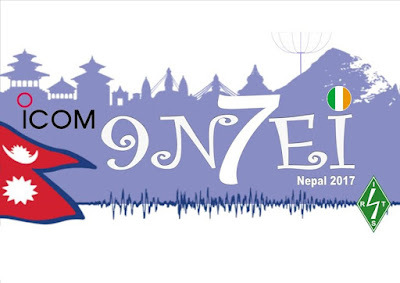 Point 5 certainly was an interesting one; when it came down to some research Nepal was number 91 in the world’s most wanted DXCC entity list and even for our planet's 3rd largest continent, North America, it was down at number 33 with South America following closely behind at number 68. So, when we put it on the green table it was decided that Nepal would be the destination of the group’s very first DXpedition. 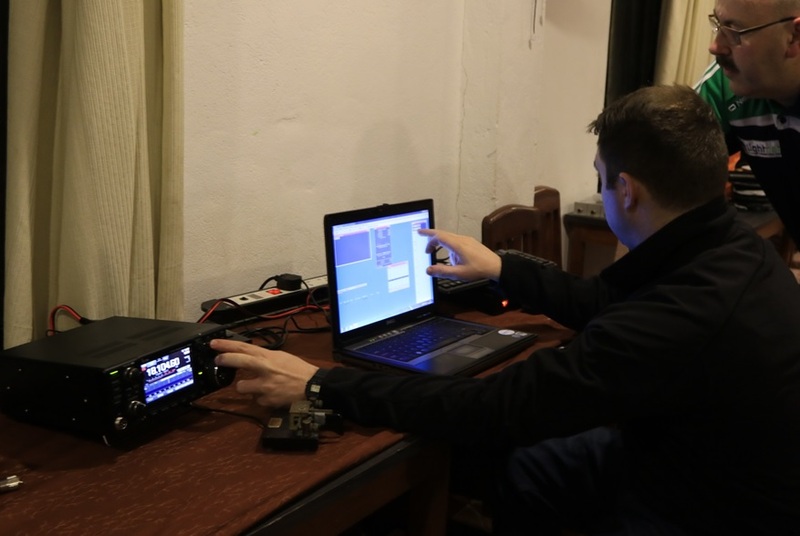 Like all trips, DXpeditions entail the same issues: travel, customs, accommodation, transmitting licence, equipment, antennas, luggage, and costs oh and of course a team. Yes! a team competent enough with the ability and skill set to deal with the many challenges to be presented ahead. The first stage of planning is usually to do with feasibility – can it be done? The actual doing certainly follows later. Obviously, travel was going to be feasible. There are scheduled airlines flying regularly to Kathmandu and there is an even wider range of hotels there to pick from, so accommodation would not be an issue. 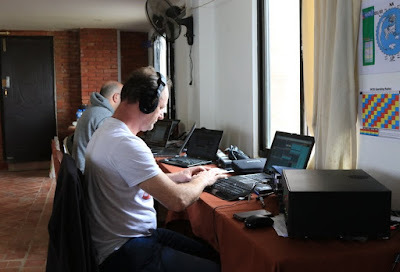 I must mention our thanks to Antonio IZ8CCW, Bernard F9IE and Eric ON7RN who from their previous MDXC activity back in 2011 under the callsign 9N7MD certainly provided us with lots of very useful information, especially during our planning stages. Thanks guys! So, with a target area in mind (Europe and North America), we set about looking for accommodation with an ideal take-off towards these directions. The 9N7MD location was certainly an interesting one but it lacked the required take-off angles to have the impact needed towards our selected target areas. Eventually, after searching various panoramas, photographs, topography charts even aerial maps up and down Nepal, we finally decided upon our QTH for the DXpedition. 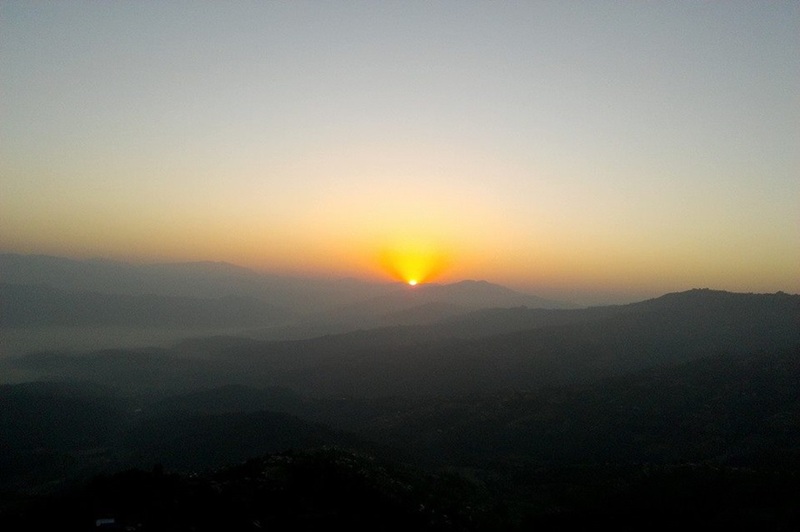 This was going to be on top of the mystical hills of Dhulikhel and from the Sojourn Himalaya Resort, which was at the highest point. The hotel was surrounded by lush green trees and offered magnificent views of the Himalaya Range and even catered to a European diet, so dates were immediately selected around March 2017 and yes, we thought, this was possibly one of the best locations for a DXpedition in Nepal. Putting a group together for any DXpedition these days can be an absolute nightmare, so it was decided amongst the group in early 2016 to have a training exercise during the summer period. The IARU HF Championship contest was an ideal event to target and with thanks to the support of our national society, the IRTS agreed to give us the National Headquarters callsign EI0HQ to run for the contest. 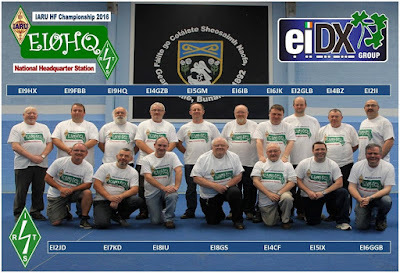 All 17 members of the EI DX Group at that time were invited to take part in this event which started on a green field site on the grounds of Garbally College in Ballinasloe, County Galway. A multi transmitter - multi operator effort was put together with the whole group putting on a fantastic display as our National Headquarters station for that July weekend in 2016. This exercise gave an idea of the skill set and experience within the group and certainly helped towards putting a team together for our first DXpedition. In the autumn of 2016 various meetings amongst the group took place where equipment and antennas were discussed, having regard to our location selected in Nepal. A huge factor in these discussions was weight and the durability of the equipment selected; also consideration was taken towards where we were positioned within the solar cycle. 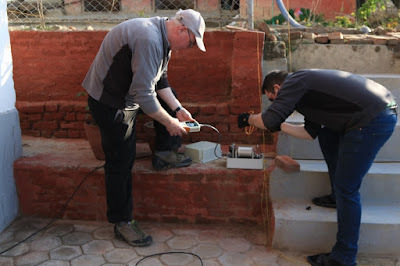 The group recognised that previous efforts of other expedition teams in Nepal had achieved 23,211 QSOs. Obviously, with regards to cost, we recognised that if a group of say 12 operators was there for say 9/10 days, then we would have approximately 216 hours or thereabouts to equal this record, making a reasonable target of 107/108 QSOs per hour, so to say four stations 27 QSOs per hour per station. This would be looked upon as the baseline of operation. With anything below this rate even within the first few days we would surely be struggling to equal the previous record set for Nepal. Yes, propagation was also mentioned many times and we all knew it would be constantly against us but being clever enough whilst making key decisions on band choices and knowing when to move to maximise openings to our target areas was certainly going to be the key to our success. An interesting development in recent years especially the field of amateur radio is SDR technology. It certainly has come on in huge leaps and bounds as of late and we were just fortunate enough to be in a position where Icom (one of our main sponsors) was releasing a brand new lightweight portable SDR radio. Yes, the famous IC-7300. This radio was selected as the rig of choice; thanks to Icom UK for giving us a generous discount in the purchase of these radios. Antennas were also discussed during these meetings and as we all know all antennas have different directional qualities. They do not radiate power equally in all directions so therefore antenna radiation patterns or plots against the limitations of our surroundings were very important calculations in making our decisions as to what was required to do the job. Charts were plotted and various predictions were made which certainly gave the group plenty of food for thought throughout the winter months of 2016. 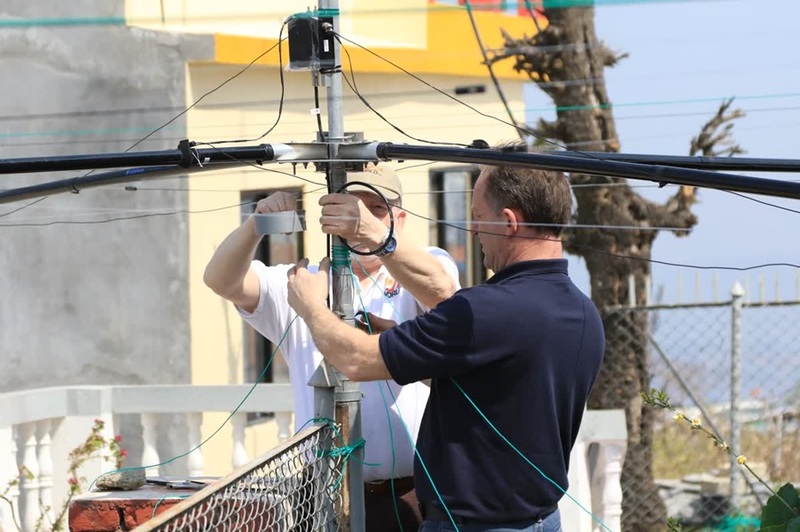 When a selection of antennas were actually made in early January 2017, it consisted of the following: 160m an Inverted L made from wire and held 22m above ground, an 80m vertical which was going to be ground mounted on an 18m fiberglass Spider-pole. For 40m this was also going to be a ground mounted vertical on a 12m fiberglass Spider-pole and for 30m we decided to use an elevated vertical on a 12m fiberglass Spider-pole. This was going to be up on the flat roof of our hotel and due to where we were positioned in the solar cycle we recognised that having a WARC beam antenna would help maximise our QSO count and give us extra gain on the WARC bands. (3el on 30m, 3el on 17m and 4el on 12m). All of these were from Spiderbeam (another one of our sponsors). 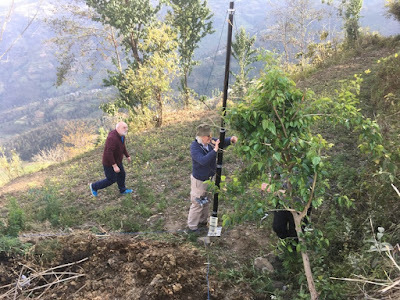 As for receiving signals on the low bands in Nepal and especially with relation to noise on vertical antennas, a broadside loop and a BOG antenna (Beverage on Ground antenna) were selected. For the higher HF bands (20m/17m/15m/12m/10m) a selection of 2 x SP7IDX Technology HEX beams were selected along with the fantastic Acom 1010 amplifier for that little bit of extra gain. There were also two sets of Dunestar Bandpass Filters selected and just over 1,100m of lightweight Messi & Paoloni coax cable. We would also use five networked laptops, running WinTest logging software in DXpedition mode. We had a realistic target of 30,000 QSOs and if we were able to achieve this not only would we set a new record for 9N but we would also get listed on the GDXF Mega DXpedition’s Honor Roll. So then, gaining our transmitting licence for Nepal. Dave EI9FBB, our expedition leader with the aid of the manager of the Sojourn Himalaya Resort, applied for a licence from Nepal’s Ministry of Information & Communication department (MoIC). Previous attempts involving local radio amateurs proved unsuccessful in obtaining a licence. Our local contact needed to make several trips into the MoIC office to explain and fight our case. Thankfully, his rate of persistence paid off and, although expensive, it was finally issued along with our requested callsign, 9N7EI. Going down this route gained our group an extra day of operating time. This department manages the postal services, telecommunications, broadcasting, press and information and film development for the country. Nepal’s licences are rather unique; especially unique is the high cost involved and the frequency pairs given. We decided that operations would take place on 9 bands and would come with a cost of $1000 ($80 per licence for 12 operators) and, if agreed, we would be given the callsign selected which was 9N7EI. 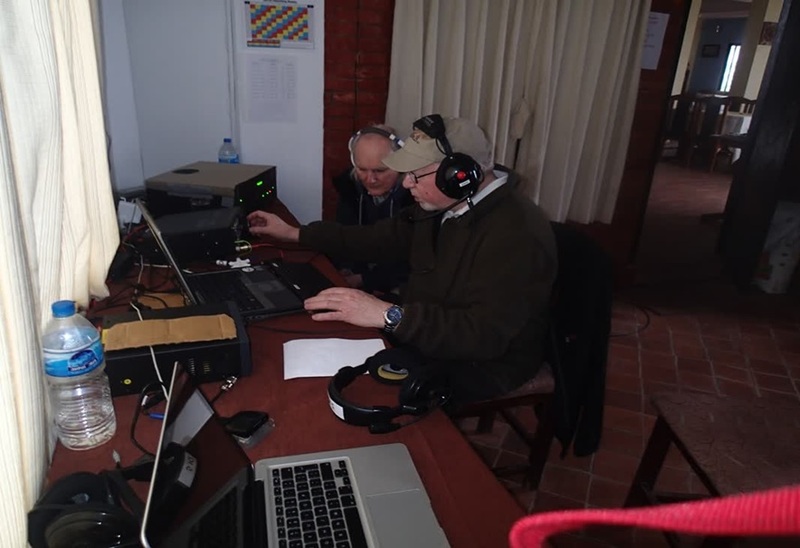 Over the winter months Dave EI9FBB, Jeremy EI5GM and Pat EI9HX decided upon a 12-man team – we planned for 4 x stations so therefore a 12 man team was ideal. 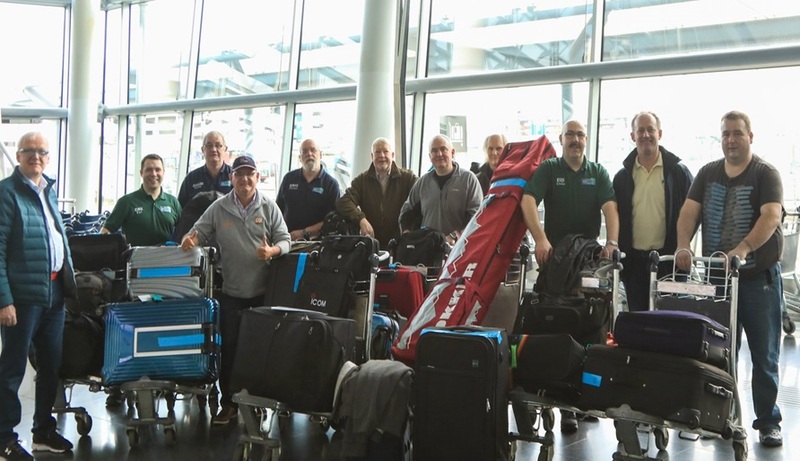 It consisted of the following Irish amateurs representing various clubs throughout the different regions of Ireland: Enda EI2II, Thos EI2JD, Alain EI2KM, Pete EI4GZB, Jeremy EI5GM, Dermot EI5IQ, Pat EI5IX, Declan EI6FR, Dave EI9FBB, Declan EI9HQ, Pat EI9HX and Hugh EI9KF. This all-Echo India team brought a wealth of experience and variety to the operation at hand - several were well known and active contesters while others were world-recognised DXpeditioners, a fantastic mix which worked well together. In early January 2017, the dates for the DXpedition were set in stone - from March 8th – March 20th. A press release was drafted and we launched our website 9n7ei.com in mid January. After news of our launch broke throughout the wider amateur radio community, we were certainly delighted to have received a very generous donation from the IRTS. It was great to have the support of our national society. At the beginning of February 2017 things were picking up pace, an operating roster was drafted up and testing of our station’s design including antenna construction began. Yes, all 500kg of it was all tested before the infamous packing process begun. Things were now in countdown mode and this DXpedition was certainly taking shape. Updates on the website continued daily. Thanks to Jari OH6BG/OG6G for his help with very useful propagation-prediction charts (VOACAP Propagation) that were made up especially for our DXpedition and aided the DXer in terms of them gaining knowledge of possible openings from their QTH with our DXpedition. With all plans in place, on March 8th, 2017 at 08:00 hours the 9N7EI team met at Terminal 2 in Dublin Airport. After the greetings were out of the way, the distribution of weight began and everybody was handed 8Kg worth of radio items to add to their luggage. The thing about being a large group with one destination and a massive amount of luggage is that airlines often allow you to check it all in at once. This was very useful to us as we were taking various connecting flights from Dublin > Amsterdam > Abu Dhabi > Kathmandu. So once the luggage had finally gone, the last Full Irish was swallowed by the team, it was time to board. Aer Lingus was our first leg to Amsterdam and then we flew with Etihad thereafter to Kathmandu for a combined total of 27 hours. The flights were long and the in-flight service… ah sure it was grand. 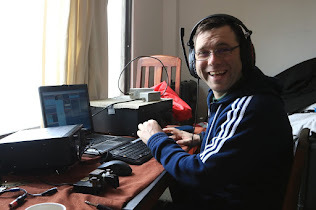 I mostly sat alongside Dermot EI5IQ and Declan EI6FR, where many discussions of their previous DXpeditions proved rather entertaining and made the journey pass somewhat quicker. Flying is always a stressful experience even making sure to be in the right place at the right time in different airports and not losing anything especially tickets, your passport or your mind can always be a challenge. But the highest point of stress I find is of course arriving at the destination because all of the unusual luggage could possibly be held by customs, thereby ruining the entire trip. Thankfully, for us this process went without any issues. 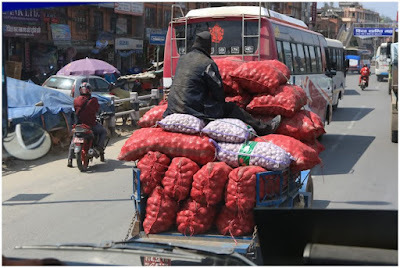 Tribhuvan International Airport in Nepal is about 6km from the city centre, in the Kathmandu valley and is apparently a haven for baggage theft. Many suitcases are stolen every day, so to reduce the risks of any of our baggage being stolen and from experience Dave EI9FBB compiled a simple yet effective system. Each bag was easily identifiable as we had every piece tagged with neon blue tape. In addition to this, each bag was also individually numbered - personal baggage was odd-numbered while radio equipment was even numbered. Our three oversize ski bags were labelled 1, 2 and 3 followed by our four peli-cases of amplifiers being 4, 5, 6 and 7. The contents of each case were catalogued so if any bag should go missing it would be easily identifiable. After all checks were done, Thos EI2JD one of the operators and our group photographer took a few group shots in the baggage area and once the photos were out of the way, the manager of the Sojourn Himalaya Resort came running into the baggage area to bring us outside. He had a fantastic welcome for us and even brought their traditional welcoming flowers that were given to each of us upon our arrival. Lots of people were coming over to us “can I help you, Sir?”. It was all a bit confusing at the time, but we spotted our bus and made a bolt for it so we could start loading in our luggage and equipment. The journey to Dhulikhel where our QTH was situated was somewhat interesting. It approximately took around an hour to get there, but along the way we passed some very interesting sites like Durbar Square, which is a complex of temples and statues and is the old royal palace. Even in the distance it was a stunning sight to see in the evening sun which lit up all the red and brown buildings surrounding it. “Something we must come back to in the coming days…” was mentioned. As we continued along the earthy roads, I was amazed at the detail and intricacy of the wood carving on some of the buildings along the way. 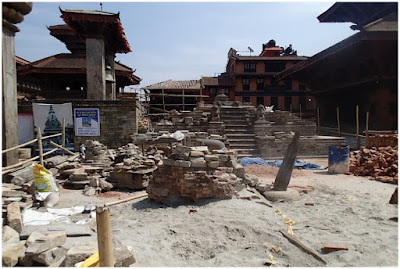 However, sadly the Gorkha 2015 earthquake caused a lot of damage to these buildings with cracks appearing in a lot of places including several statues and temples being demolished. This was sad to see as it has such a big impact on tourism, which is a vital part of the Nepalese economy. I couldn’t help but notice along our journey cattle, monkeys and various wildlife everywhere, which made the journey very atmospheric. This already was such an interesting place and not even a radio switched on yet. Traffic to Dhulikhel was slow and the roads were somewhat chaotic, I managed to spot a few prayer flags along the way up to our hotel and even witnessed an amazing sunset take place through the mountains just before we arrived in the village of Dhulikhel which sits along a ridge of a valley. 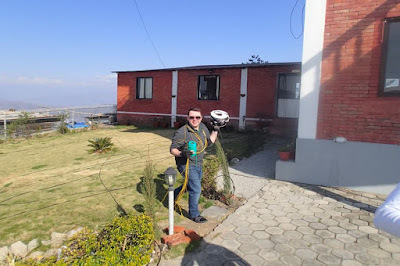 Upon our arrival at the Sojourn Himalaya resort, the staff helped us unload our baggage and equipment into the conference room which was going to be the home of 9N7EI for the next ten days. 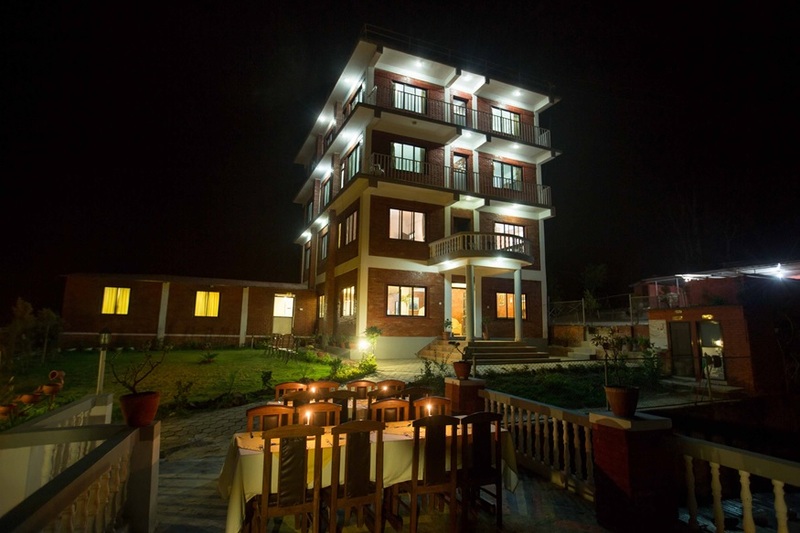 The hotel staff at the Sojourn Himalaya Resort were excellent, very helpful and courteous. They checked everybody in quickly and paired us off into shared rooms, then after a quick freshen up the staff had prepared an evening meal for us. We ate like kings that evening. I was delighted with their choice of food it was a mixture of Chinese and Indian which was excellent. 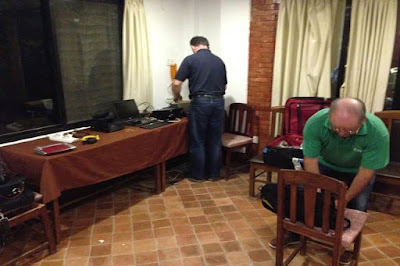 As soon as we finished we were very eager and motivated to get the conference room prepared so we began station set up. After the general layout of the room was put in place, then laptops, rigs and amplifiers were set up and it was then time for a well -earned rest. Nobody needed rocking to sleep that night! At 06:00 everyone was up and at it, raring to go! The breakfast was grand and with a brief meeting we were all broken up into teams to start on the outside work. Masts, antennas and cable were strung together and after some lunch we had all the outside work complete, one couldn’t help but notice that when outside the weather was changing throughout the day and it became cloudier certainly into the afternoon. Once we had all final checks and tests conducted, we could put our first signals out at 12:00UTC on March 10th. 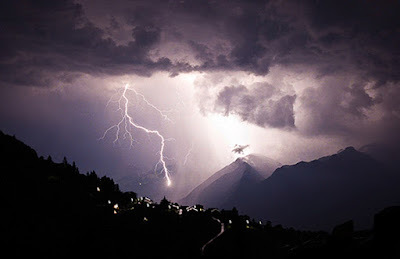 By this time of the day we had already experienced several power cuts to the hotel and lightning storms were beginning to appear! This was not good news. All four of our stations began calling CQ. We were in full swing at the time with a few hundred QSOs in the log, when, next thing... BANG… Our first power cut and to be the first of many. We closed the station down that evening while the lightning storm passed. Operators got some much-needed rest and just before our grey-line in the early hours of the morning, we were back up and running on air again. We all operated pile-up style just giving a brief 59 or 599 report to each station, so that as many people as possible could make a contact with the rare country. There was no sunspot activity and we were fortunate to have a low A and K index for the DXpedition although static noise was frequent. The pile-ups continued and propagation was very strange with some weird openings at times; strangely enough right after sunrise each day the bands would all die away with no signals anywhere in the spectrum except for the first hop on 20m and then later in the day propagation would start to increase up the bands, where we were constantly trying to find openings with our targeted areas. Every time an EI went through our log there was a massive cheer in the room… it was great working your home country from abroad. Declan EI6FR and myself (Pat EI5IX) put together the 160m inverted-L made from wire and tuned it to a 1.3:1 SWR for the CW section of the band, this was held off the roof of the hotel at 22m above ground. That first night on 160m will never be forgotten, the A and K index were particularly low and we said, “ah sure we would give it a bash”. “Probably work only a few lads up the road”, was said. Tuned up the system and I put out a few CQs on CW and nothing, next thing… what’s that… nah… were getting spotted in Russia and some Eastern European countries? WOW is this happening? couldn’t be, could it? 160m opened for us that night with some amazing QSOs made. I’ll never forget making some QSOs with EI stations Doug EI2CN and Don EI6IL. The adrenaline rush going through you whilst trying to get all the characters across on the key… it’s exhilarating! The next day we had visitors to our station, members from the SK3BG Group, Rasmus SA2LUL, Johannes SA3TOA, Felicia SA3MAJ and Jonas SA3JIF their teacher. They were in Nepal on an interesting project. Their secondary school studies natural science with focus on civilian crises management and during the 2015 earthquake in Nepal. They followed the terrible catastrophe closely and they became aware of the unique function that amateur radio played in the communication in and out of Nepal. After that, Jonas SA3JIF and his pupils considered becoming radio amateurs. The pupils interested passed their exams and got their license and were on a 21-day study trip to Nepal. 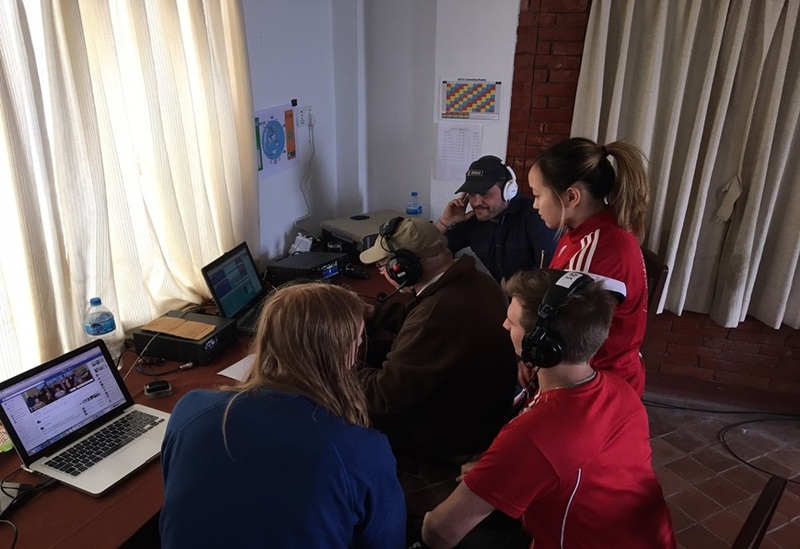 They went to visit NAROS (Nepal Amateur Radio Operator’s Society) to learn more about their work and how they could help in future catastrophes in Nepal. 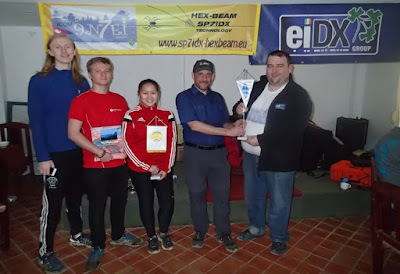 They came along to our station to see how a DXpedition was put together and to try to make a QSO with their SK3BG Group back home in Sweden. They were successful in making this QSO and we would like to thank them for coming to visit us and look forward to hearing them on the air in future. The pile-ups and power cuts continued as did the QSO count and each operator was well drilled and in a groove at this stage. My routine was sleep, eat, operate, eat, operate, sleep, etc., not necessarily in that order either. Many hours were put in on the radio and everyone was committed to the cause. 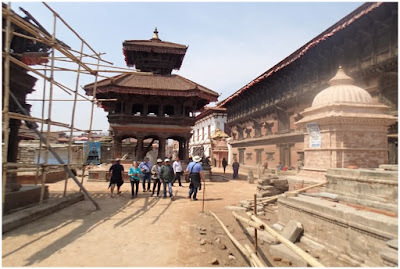 A refreshing break was mentioned one day over lunch, a bit of sightseeing, so we organised a day trip to the UNESCO world heritage sites like the Basantapur and the Patan in Durbar Square in Bhaktapur. This is a historic little town which is just a short drive outside of Kathmandu and about an hour from Dhulikhel. The name, Bhaktapur, literally means a ‘place for worshippers.’ But it’s much more than that. It’s got something for everyone. Nearly two years after the Gorkha earthquake of 2015, Bhaktapur Durbar Square still bears the reminders of the devastating quakes — buildings with archaeological importance supported by poles, damaged statues and temples with workers clearing the debris of what’s left of the demolished structures, I found there was an eerie silence around the place but was amazed to see some of the temples and houses made of bricks literally just glued together with mud. The streets were bustling with worshippers, residents, tourists and folks from all over Nepal and as you walked around you couldn’t help but notice the many handicrafts; men selling some amazing items like, cashmere clothing, Thangkha paintings, dragon masks, little temples made of wood, and other artifacts made from brass. These are regular sights at Bhaktapur Durbar Square nowadays — the quake aftereffects remain, reconstruction work is on-going and the number of visitors is increasing, which is great for Nepal’s economy. I can only recommend going there at least once in your lifetime. We also celebrated St Patrick’s Day on March 17th here, and a fantastic meal was put on for us that day and washed down with some “Everest” beer. Tasty stuff I might add. So as the days progressed, so did our QSO count and just after 30,400 odd QSOs, we had another power cut. Everyone agreed at this point, that we should go QRT and make use of the daylight hours that were left to begin station tear down. This consisted of taking down all our antennas, rolling up the coax and re-packing everything in the correct order so it could be weighed and accounted for before our departure the next morning. The tear down went smooth and that evening the Hotel staff put on a party for us where we got to exchange pleasantries and a chance to relax and enjoy a few drinks with the whole group and reflect upon a job well done. Everybody got an early night that night and was up bright and early for breakfast the next morning. The hotel staff had a fantastic farewell ceremony for the whole group and helped us load our luggage onto the hotel bus and get us ready for our journey back home to Ireland. We would like to thank all of you for taking the time to work us on the air and for your support throughout this DXpedition. Soon after our return, our log was uploaded to LoTW and to date ALL QSL cards have been mailed. Thanks to our QSL Manager, Charles M0OXO for doing a fantastic job with our QSL work. We’re already looking forward to our next EI DX Group adventure … we hope you are too … watch this space, it will be announced soon!